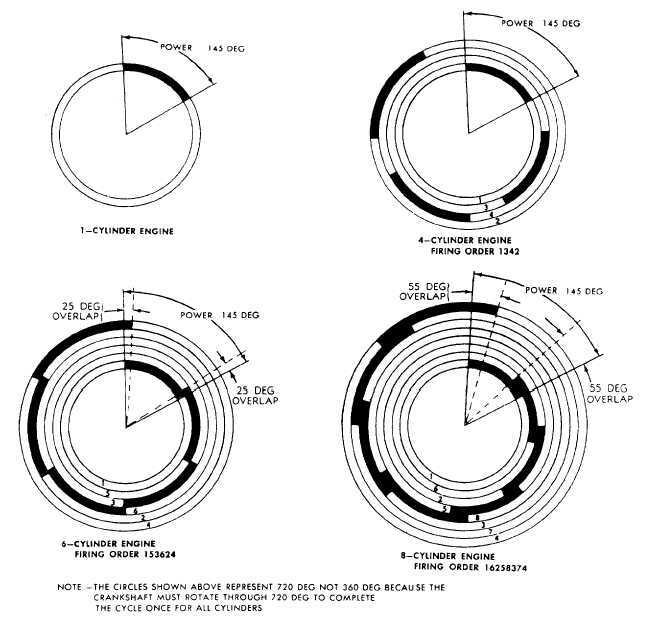 Figure 3-8.-Power strokes in one-, four-, six-, and eight-cylinder engines. Home > Construction Training Manuals > Construction Mechanic Advanced > Figure 3-8.-Power Strokes In One-, Four-, Six-, And Eight-Cylinder Engines. As cylinders are added to an engine, each one must complete the four steps of the cycle during two revolutions of the crankshaft. The number of power impulses for each revolution also increases, producing smoother operation. If there are more than four cylinders, the power strokes overlap, as shown in figure 3-8. The length of overlap increases with the number of cylinders. The diagram for the six-cylinder engine shows a new power stroke starting each 120° of crankshaft rotation and lasting 145°. This provides an overlap of 25°. In the eight-cylinder engine, a power stroke starts every 90° and continues for 145°, resulting in a 55° overlap of power. Because the cylinders fire at regular intervals, the power overlap will be the same regardless of firing order and will apply to either in-line or V-type engines.